Are you lost regarding out-of-bounds rules? Then it's mandatory you check this out. This is the first Rules School topic since the PDGA Rulebook and Competition Manual was updated for 2011. The good news is the OB rules did not change in 2011. The bad news is some players and even TDs still have trouble following them. Maybe the following discussion can help. 803.09A. A disc shall be considered out-of-bounds only when it comes to rest and it is clearly and completely surrounded by the out-of-bounds area. A disc thrown in water shall be deemed to be at rest once it is floating or is moving only by the action of the water or the wind on the water. See section 803.03 F (Marking a Lie). You cannot determine whether a disc is OB until it stops moving from the effort made by the thrower. The disc can land OB and skip out, roll thru OB or fly over it for most of its flight. But if it doesn't stay in the marked OB area, it's not OB. Where a disc first comes to rest in water simply from the effort made by the thrower can be a tricky call especially if the water is moving. It's important for the group to have a spotter for these types of situations or for the group to hustle and see where the disc lands. Otherwise, the disc might float to an inbounds bank where it might remain inbounds when it was really OB. Or, the player might claim that location was the last point inbounds and get a much better mark. It can also work to the advantage for a player when a disc lands on a beach inbounds and the waves pull the disc OB before the players see it was actually inbounds when first at rest. Discs landing in the wave pattern on a beach can be difficult to call in general. The benefit of the doubt is given to the player where a disc is only considered OB if it is always surrounded by water, not just covered by waves part of the time. 803.09A (cont.) The out-of-bounds line itself is considered out-of-bounds. This simple statement seems to baffle even experienced players, possibly because our OB lines can be all widths from razor thin edges to thick uneven lines and comprised of all kinds of materials from posts to curbs to fences to paint and to string. The following diagram shows some disc locations in relation to the relatively wide OB line going down the middle. The blue discs at each end are completely inbounds (IB) and completely OB so no problem. The pink discs are both barely touching the OB line. However, most of the left pink disc is inbounds so it's IB. Since the OB line itself is OB, the right pink disc is OB because it's completely in the OB area which includes the OB line. The orange disc straddles the OB line. Since a sliver of the disc is over the inbounds area, the disc is IB. The disc only has to have a little bit of the disc touching or over inbounds. If these discs are suspended in these positions above the ground and the 2-meter rule is not in effect, the IB and OB status of these discs would be the same as shown. If it looks like any part of the disc is over the inbounds area, the disc is declared inbounds. If the 2-meter rule is in effect, then the 2-meter penalty would apply to the left three discs. The OB penalty would still apply to the two discs on the right instead of the 2-meter penalty since the OB rule takes priority over the 2-meter rule. 803.09A (cont.) In order to consider the disc as out-of-bounds, there must be reasonable evidence that the disc came to rest within the out-of-bounds area. In the absence of such evidence, the disc will be considered lost and the player will proceed according to rule 803.11B. This part of the OB rule tends to be overlooked because players are trying to find their disc, and when they don't, they typically look at the Lost disc rule rather than this OB section. If the group believes there's reasonable evidence the disc they can't find is likely in the OB area where they are looking, then the 1-throw OB penalty and marking options (listed next) apply rather than the Lost disc penalty. For example, if the playing surface around the OB area is nicely mowed grass and the disc can't be found, that might be reasonable evidence it's OB. If it's wildly growing schule around an OB pond, that might indicate the disc should be declared lost unless the group really had a good sight line to watch the throw almost certainly heading OB. (3) Within the designated Drop Zone, if provided. These options may be limited by the tournament director as a special condition (see 804.01). Options (1) and (2) for marking the next lie are almost always available when a disc goes OB. Although option (1) talks about marker discs, the tee is sometimes the previous lie. Some OB areas have Drop Zones marked as option (3). When all three of these options are available, the player may choose which one they want unless the TD has stated that a specific option must be used. If the player chooses marking from the last point the disc was inbounds, that mark is made up to 1 meter perpendicular to the OB line at that point, even if that moves towards the target. Although discussed in the Marking a Lie rule 803.03C, it's a good time to point out that if a disc lands inbounds within 1 meter of an OB line, the player may move the lie perpendicular to the OB line up to a meter away with no penalty. The 1 meter allowance has been provided so players have room to take a stance where none of their supporting points are OB at the time their next throw is released. The most controversial part of this rule for some players is the special situation shown below where the previous lie (A) might be closer to the target than the last point the disc was inbounds (B). This can happen when a missed putt hits the basket and rolls down a hill into an OB area that's farther away from the target than the putt just missed. Unless the TD has stated otherwise, the player may throw from the last point inbounds (B) or from their previous lie (A) closer to the target. 803.09C. The Rule of Verticality. The out-of-bounds line represents a vertical plane. Where a player’s lie is marked from a particular point within one meter of the out-of-bounds line pursuant to the rules, the one-meter relief may be taken from the particular point upward or downward along the vertical plane. We know a disc completely above an OB area is OB because the OB boundary line surrounding the OB area extends upward as a vertical plane. 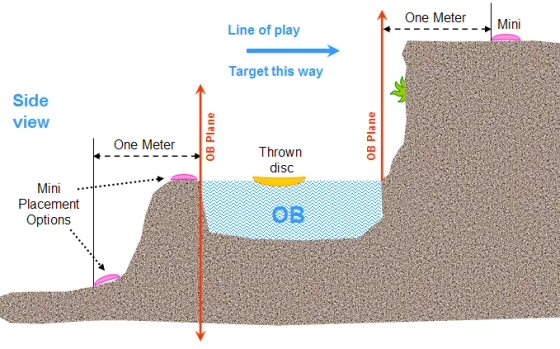 If the inbounds area next to the OB line/plane is steeply sloped upward or sometimes downward, it's possible that moving 1 meter inbounds from the OB plane from where a disc went OB will be much farther up or down the slope than 1 meter. Take a look at the cross section diagram below for some examples where a player could get a better lie for their next throw if marking 1 meter in from the OB plane versus measuring from the OB line along the ground. In the diagram, the player was throwing the orange disc from left to right and it landed in the narrow OB creek. If the throw hit the right wall where the green plant is growing, then the player gets to mark on top of the right embankment as shown by the pink mini on the right. That should provide just enough room for the player to take a proper stance. Note that the mark is allowed to move toward the target. If the orange disc barely made it into the water without ever reaching the right creek wall, then the options for marking are shown by the two pink minis on the lower left side (or any points in-between if the mini will stay on the slope). See how the red OB planes go vertically up and down as needed to determine where to measure up to 1 meter relief. Even though the creek bed is sloped under water on the left, the vertical plane goes up and down from the OB line where the water meets the playing surface. Note that the maximum 1 meter distance is always to the back edge of the mini as the player faces the target. 803.09D. If the inbounds status of a disc is uncertain, either a majority of the group or an official shall make the determination. This issue might occur in two ways. The first is when the marking for the OB line is not sharp such as a paint line, a grass/dirt interface or perhaps a broken string. Or maybe the disc is above the ground and it's hard to see if the disc is completely over the OB area. The group must make the OB decision if an official is not available. If the vote is tied, the benefit of the doubt goes to the player [803.01D(1)]. If a digital photo might show sufficient detail for a TD to make the call, then a picture can be taken if a camera is available. The player plays provisional throws to complete the hole as if the disc were IB and as if the disc were OB and let the TD decide later from the photo evidence. The second scenario occurs when the group doesn't know if an area is OB or not. Examples might be not paying attention at the player meeting or carrying their player guide, OB markings disappearing during the round, or maybe not knowing if the OB line is defined by the outside or the inside of posts in a line. Another circumstance might be the TD forgetting to extend an OB line far enough or looping it back so that OB is an enclosed area. For all of these situations, if a clear determination for what's OB can't be made, then the player completes the hole with provisional sequences as if the disc were OB and as if it were IB. 803.09D (cont.) If the thrower moves the disc before a determination has been made, the disc shall be considered out-of-bounds, and he or she shall proceed in accordance with 803.09B counting all throws made prior to the determination of the inbounds status of the original lie. If a player other than the thrower moves the disc before a determination has been made, the disc shall be considered inbounds, and play for the thrower and the mover of the disc shall proceed under the rules of interference, 803.07 B and C.
The key idea here is "Do you have a witness?" A thrower or player who gets to a disc thrown near an OB area can look but not touch until another player gets there to confirm an IB or OB ruling. Otherwise, the first to arrive and mark or pick up the disc will be penalized. If it's the thrower, then they automatically get the OB penalty even if their disc was inbounds. Any other player but the thrower will get a 2-throw penalty under the Interference rule 803.07C and the thrower's disc will be declared inbounds even if it wasn't.